Equalize takes a focussed and extremely powerful approach to EQ that, once understood, becomes second nature. Expensive sound. Transparent at all times. Gentle or radical shaping. Forces good mixing practices. Becomes intuitive after a learning period. Slightly odd layout. No narrow Q width or master gain control. The last EQ plugin released by Kush Audio was Clariphonic DSP, which impressed us despite being limited to only two shelves, facilitating boosting only (no cutting), and sporting just a handful of fixed frequencies to choose from. Kush's approach to plugin design can seem quite alien next to the feature-rich processors we've grown accustomed to, focusing on high-quality sonics through a deliberately restricted workflow. "Each band is very smooth and wide, making the plugin primarily useful for applying radical shifts in tonality"
Electra DSP (VST/AU/AAX) certainly fits that description, as we'll reveal, but unlike its predecessor, this particular EQ covers a full range of frequencies and is capable of cutting as well as boosting. Electra DSP is an emulation of Kush's Electra hardware EQ. On the face of it, it's a pretty basic four-band affair with nothing onboard to get particularly excited about. You get a high shelf that'll do up to +/-12dB from 3.8-20kHz, a low shelf (+/-9dB over 25-400Hz), and two +/-12dB proportional Q bands that cover a combined range of 30Hz-5.4kHz. Notably, the low shelf can be switched to a 12dB resonant high-pass filter. The black outer ring on each band selects the frequency, while the silver inner ring dials in the gain amount. The potential fiddliness of the former is alleviated by the area around each black knob being a viable mouse pointer target as well as the knob itself. You might be wondering why you'd ever need such an apparently inflexible EQ, and the answer is that Electra DSP is intended for broad- strokes frequency shaping. 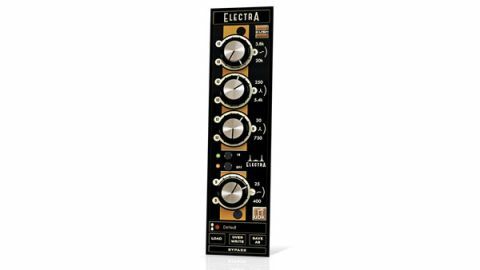 Each band is very smooth and wide, making the plugin primarily useful for applying radical shifts in tonality, be it for the subtle refocusing of an instrument or more heavy-handed adjustment - although Electra always sounds very natural due to the aforementioned wide bands. In use, Electra DSP's broad bands make it feel like you're not really EQing in the traditional sense. Your attention is diverted from the traditional number-based frequency paradigm as you're forced instead to rely on your ears and pay attention to the more abstract sound qualities being affected. Some might hesitate to use words like 'air', 'depth', 'smack', 'sweetness' and so on, but these really are the sorts of descriptions that come to mind when dealing with such wide frequency ranges. Like other Kush plugins, Electra DSP's interface and deliberate functional restrictions aren't going to be to everyone's taste; but if you've ever found yourself fiddling for longer than you'd like trying to dial in the perfect vocal EQ, this novel approach could be just the thing you never knew you needed. Though not an EQ for every occasion, given a chance, Electra DSP can help to make rapid and dramatic improvements to your mixes without ever making you feel like you're working hard to get the best out of it.